Humans are weak. Lacking the claws and thick skins of other animals, we are forced to rely on members of our own species to survive and flourish in the world. The fact that the human infant is born in an utterly helpless state also makes others' protective care necessary. Attachment, bonding, concern, and mutuality thus become cornerstones of human existence. Trust also enters this equation. Originating in the early mother-child relationship, trust continues to grow, get contextually refined tempered by reality testing, and gain nuances throughout the subsequent adult life. Its absence (mistrust) or malformation (distrust) contributes to psychopathology and is responsible for much intrapsychic distress and interpersonal strife. Given its formative significance and it crucial role in the therapeutic process, one is surprised by the paucity of psychoanalytic writings specifically devoted to the topic of trust and mistrust. Few, if any, monographs on trust exist. 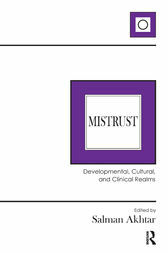 A collection of essays written specifically for this volume, it deals with the ontogenesis, psychopathology, cultural vicissitudes, and technical implications of trust and mistrust.